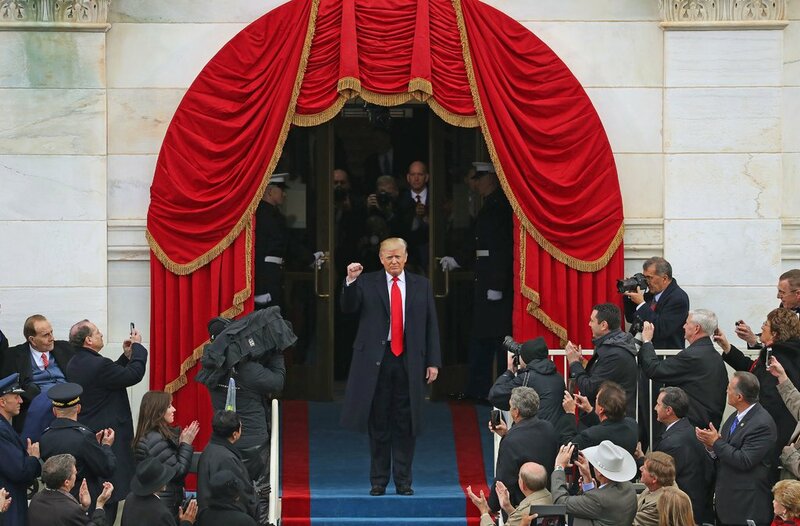 On his inauguration day, President-Elect Trump makes his entrance at the Capitol. 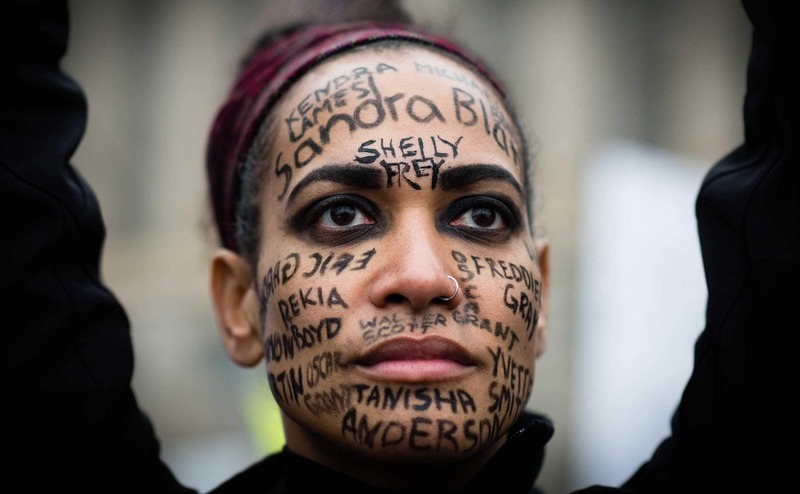 Across Aisha Bain’s face are names of African Americans who died because of violence. She marched with Move to End Violence, an organization focusing on ending violence against women and girls. 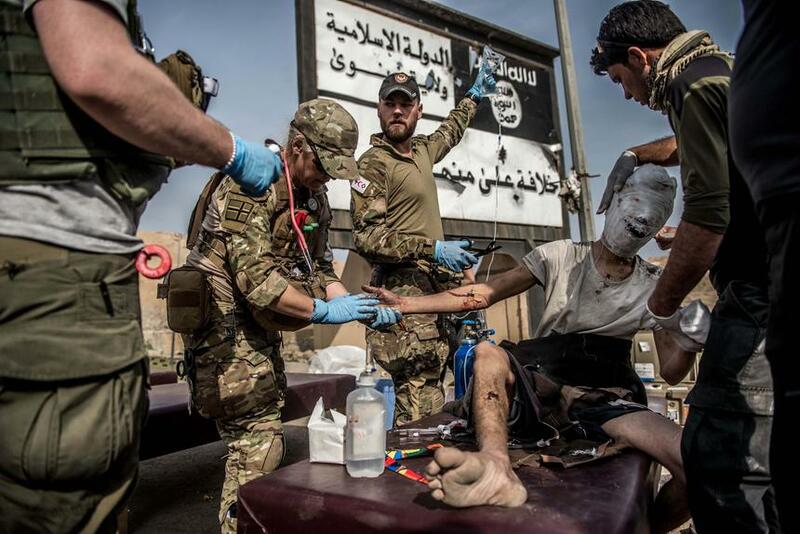 Medics attend to the severe burns of a man recaptured from the Islamic State by US and Iraqi Troops. 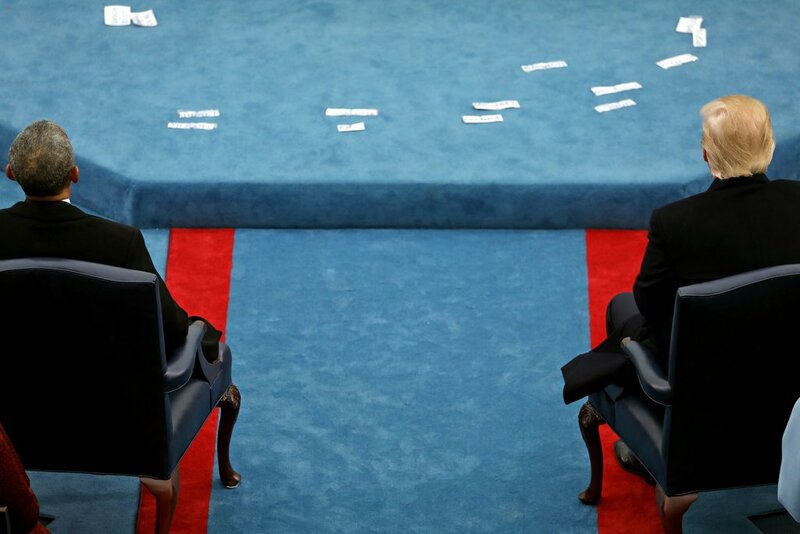 Presidents Obama and Trump at the 58th inauguration. 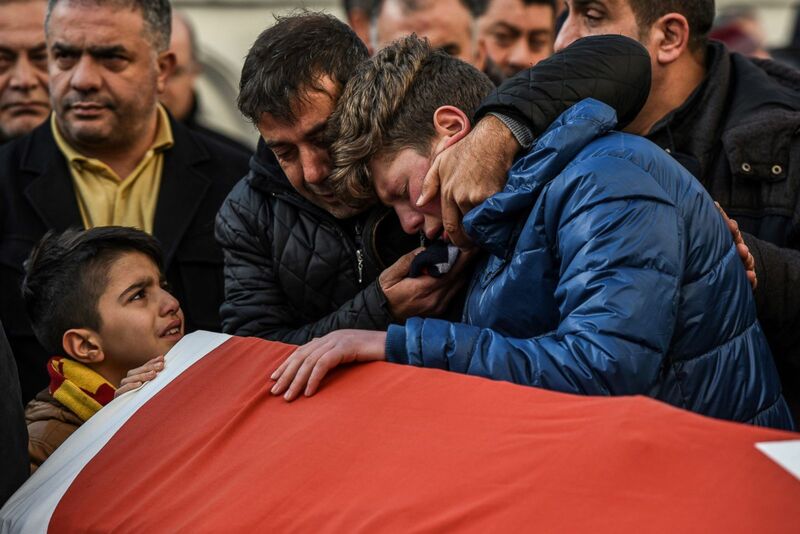 Relatives mourn at the funeral ceremony of Ayhan Arik, one of 39 victims of the Reina nightclub shooting on New Year’s Eve. 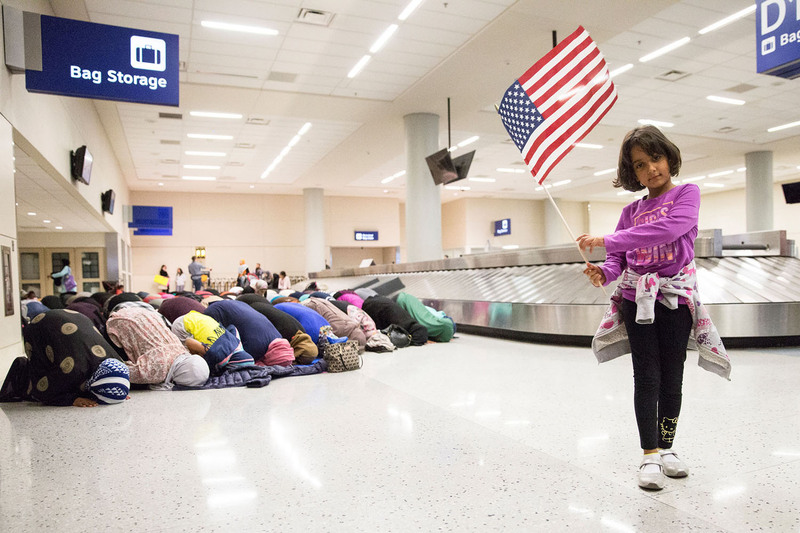 During the protest of Trump’s executive order that implemented the travel ban, a girl waves the American flag while women pray behind her. 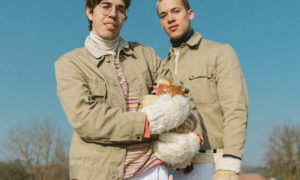 Protesters at the Women’s March. 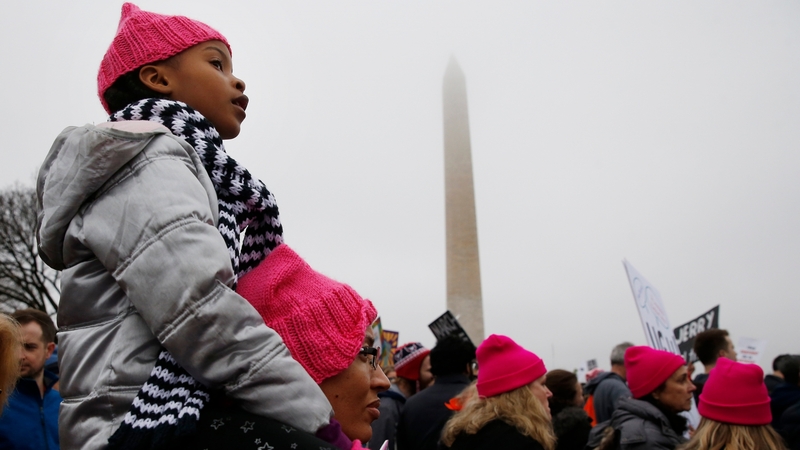 Over 600 protests lead to nearly 4,000,000 marchers across the nation. 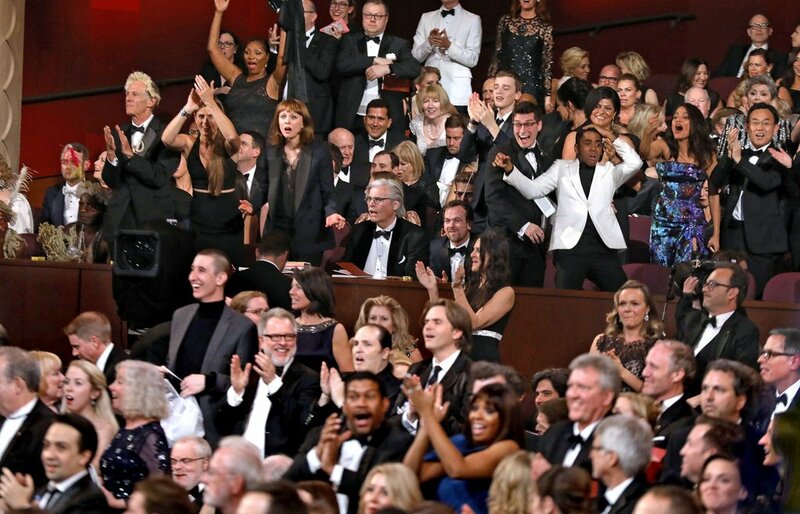 Audience at the Academy Awards learns the best picture honor went to “Moonlight.” At first, it was incorrectly announced that “La La Land” had won. Protesters after the “Peace for Iran” rally had taken place at Lafayette Square. 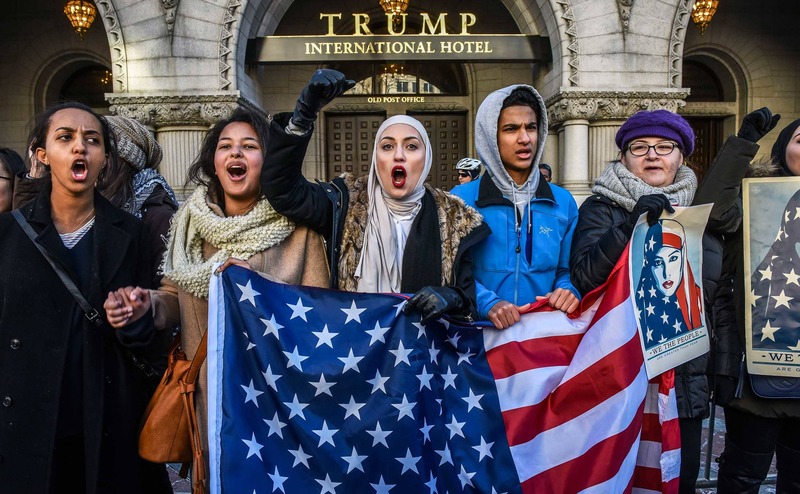 Thousands had rallied there to protest Trump’s travel ban. 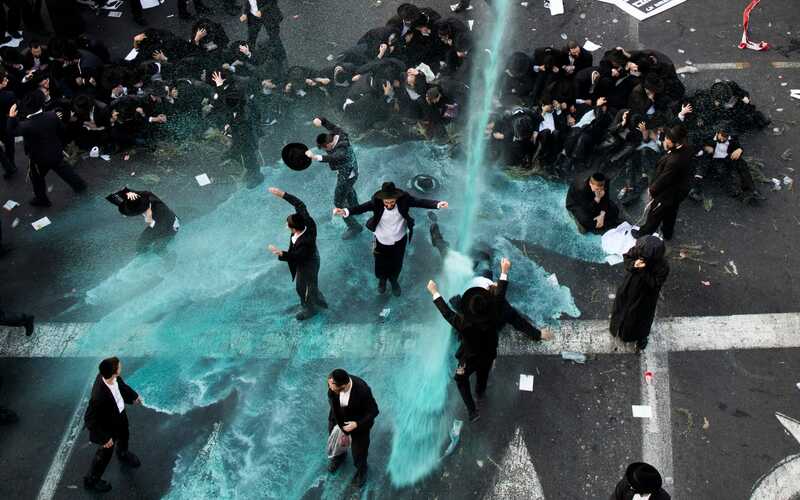 Ultra-Orthodox Jews protesting army drafts are hit by Israeli Police water cannons. Ultra-Orthodox Jews are free from serving when attending yeshiva schools, where religious texts are studied. 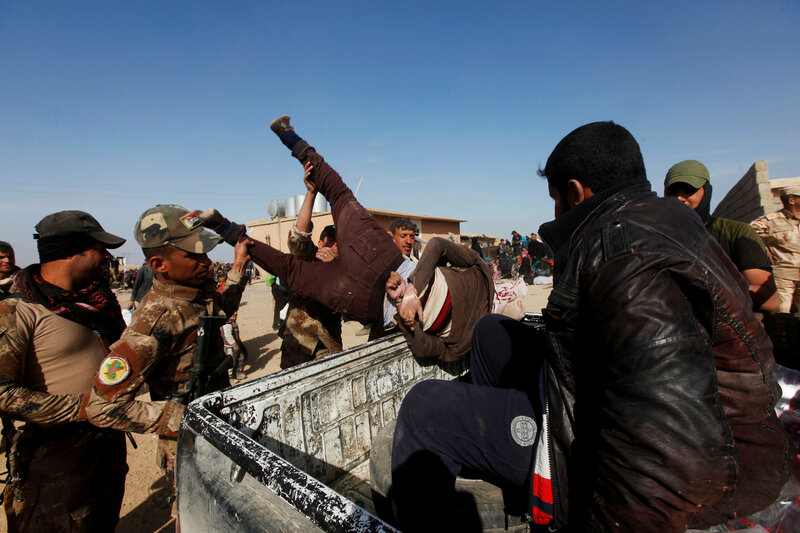 During the Battle for Mosul, Iraqi special forces take in a man suspected of being part of the Islamic State. 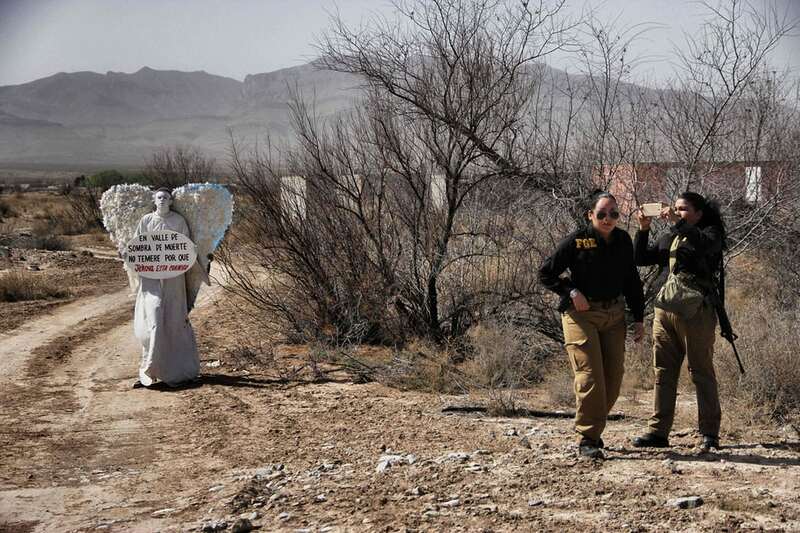 Dressed as an angel, a woman holds a sign for the women whose bodies have been dumped in the Navajo arroyo. Her sign reads “in the valley of the shadow of death I do not fear because jehova is with me”. 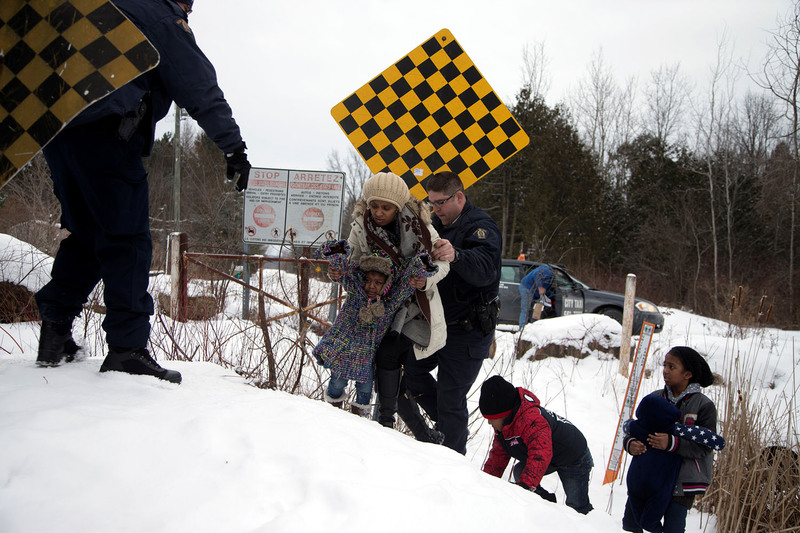 Claiming to have taken a taxi and walked across the US-Canadian border, a family is taken into custody after telling police they are from Sudann the US has lead asylum-seekers to continue crossing over the border this year. 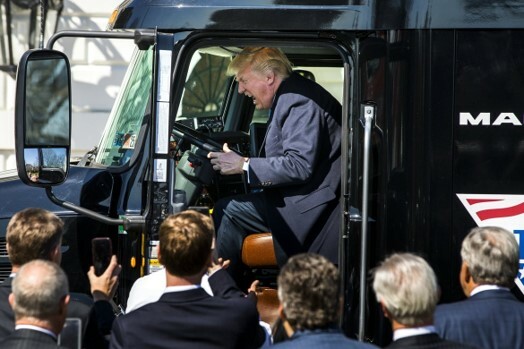 The President sits in a fire truck made in Wisconsin. His “Made in America” product showcase presented items from every state. 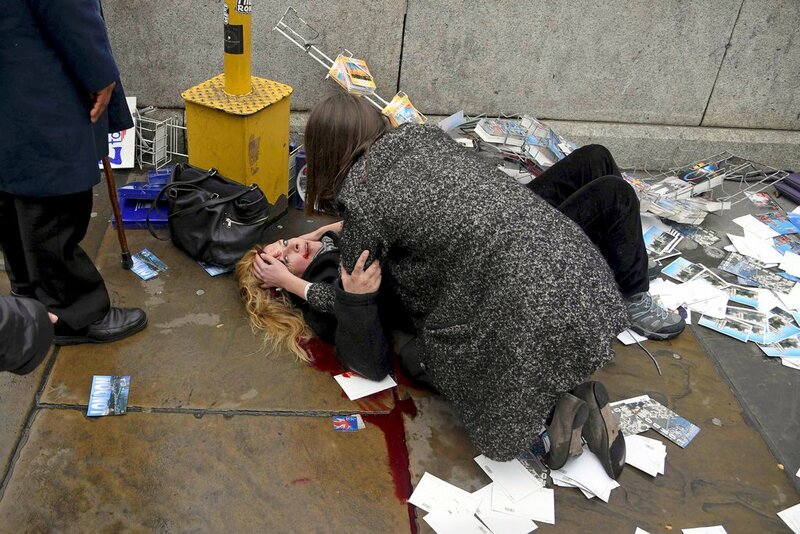 At the scene of a terrorist attack, an injured woman receives aid. On the bridge, Khalid Masood had mowed down people with his car before crashing and than stabbing people near the House of Parliament. 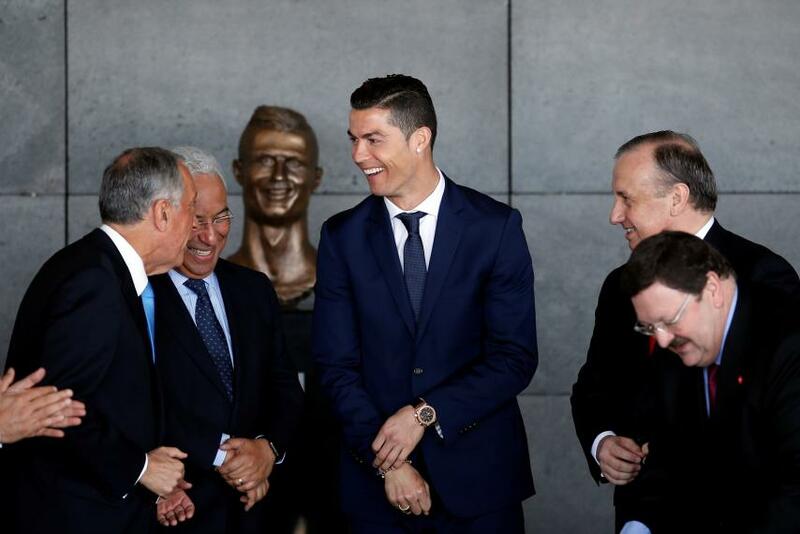 Cristiano Ronaldo (center) attends a ceremony at an airport where he received a sculptor of himself and the honor of having the airport named after him. The sculptor’s odd appearance went viral on the internet and led to a string of memes. 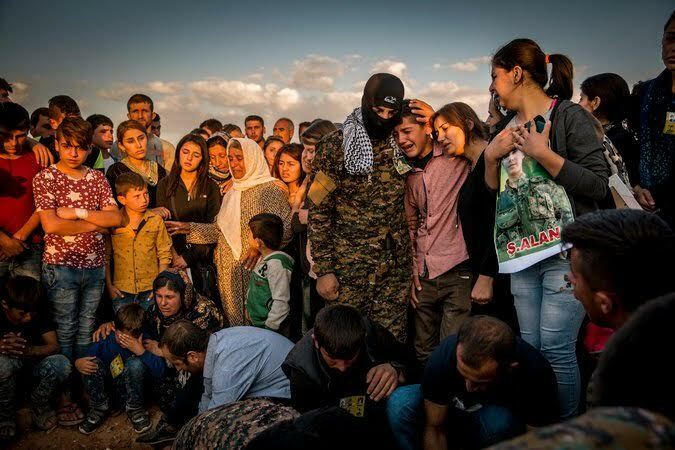 A mother grieves for the loss of her son; his life was taken after a attack by the Islamic State. 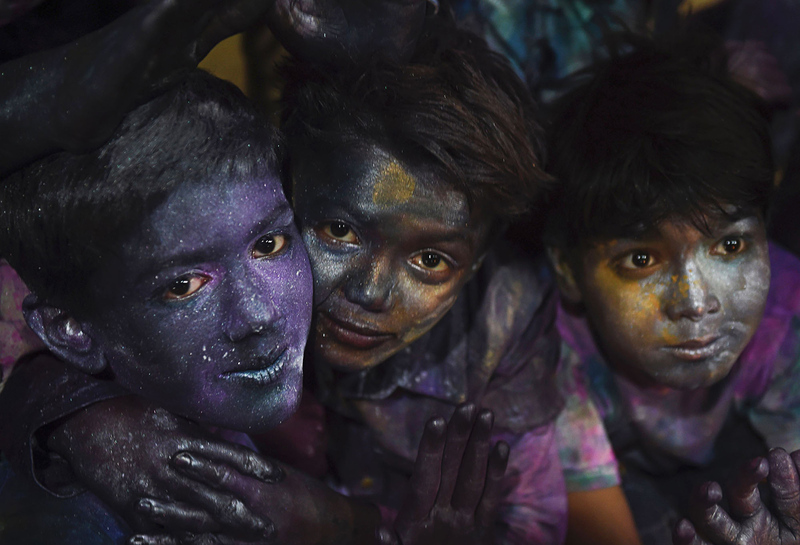 Pakistani Hindu children smeared with colors during a Holi celebration. 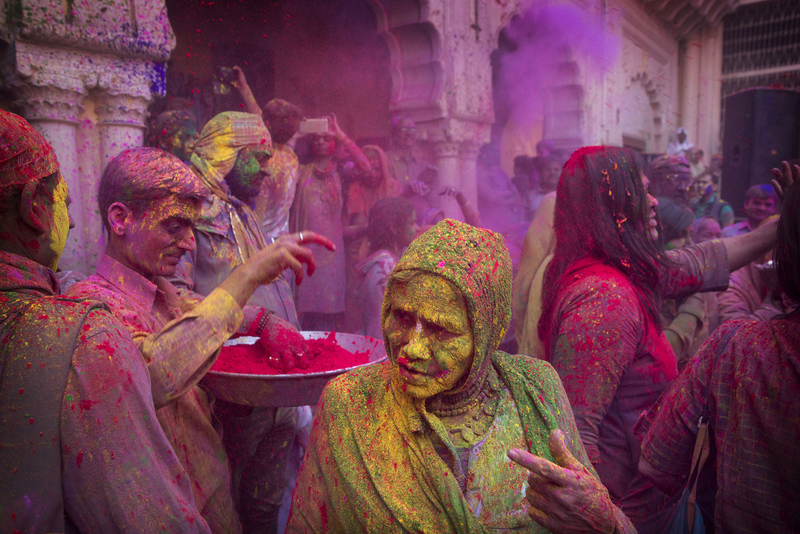 Indian widow celebrates Holi. Their presence considered inauspicious during religious events a few years earlier, Hindu widows were expected to wear in white and pray. 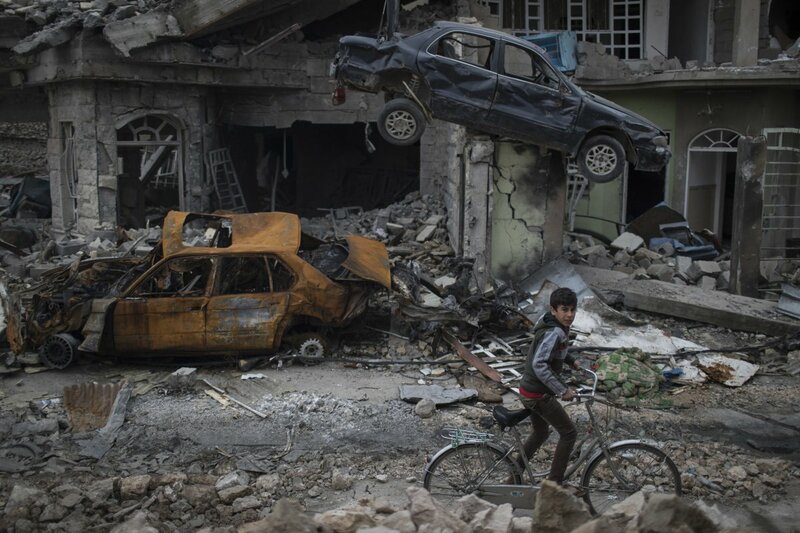 In a neighborhood recently freed by Iraqi forces, a boy passes destroyed houses and cars. 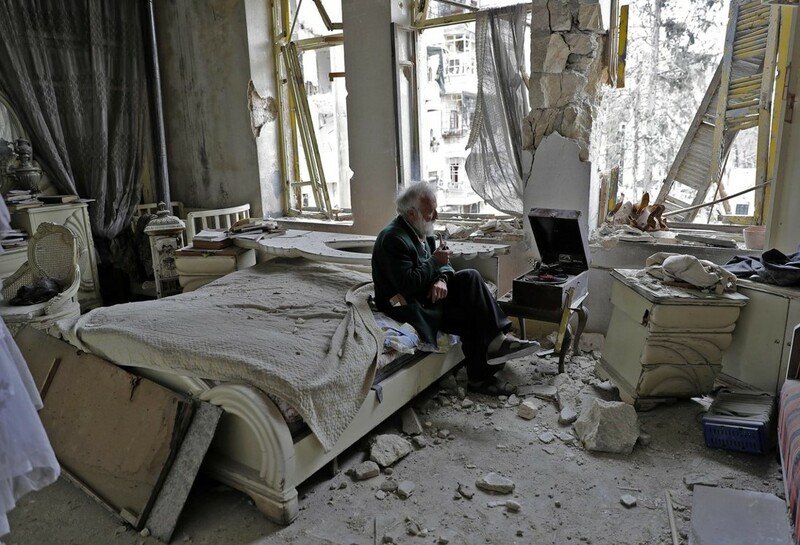 In a city at the center of a civil war, 70-year-old Syrian Mohammad Mohiedine Anis listens to music in what was his bedroom. 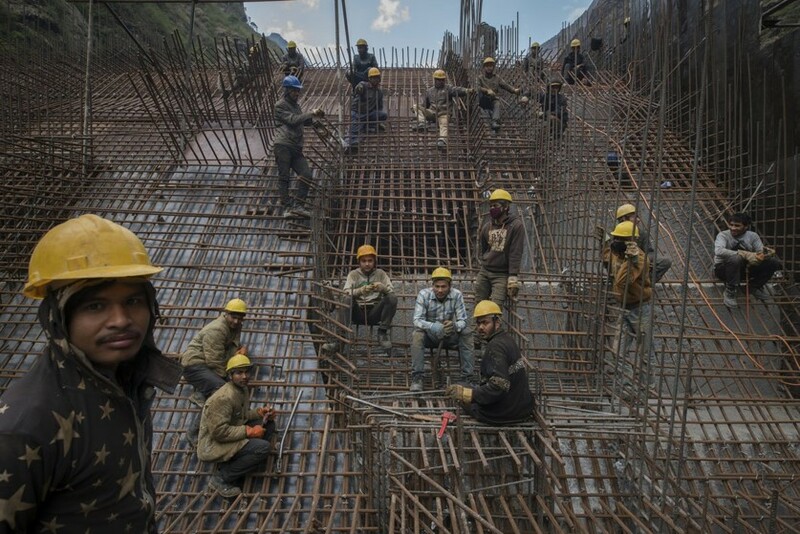 Nepal labor workers working on the Upper Tama Koshi Hydroelectric Project. In hopes of becoming a leading Asian electricity source and advancing among their neighboring countries, Nepal has turned to clean energy. 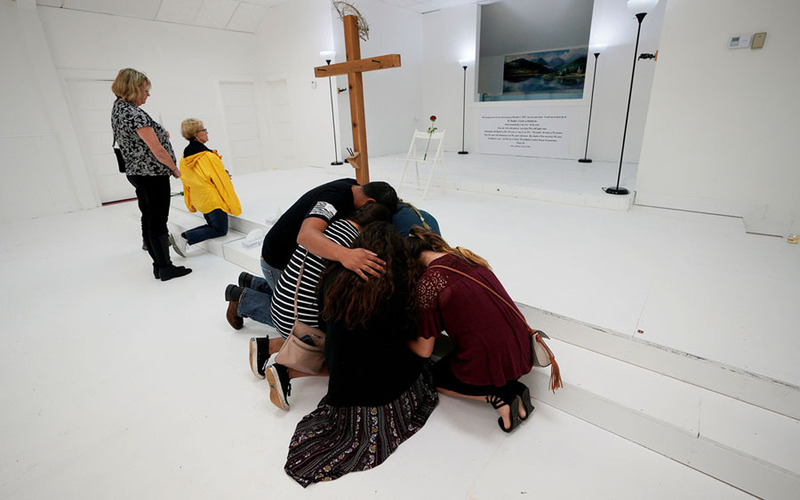 A woman stands in Mar Girgis Church after the Islamic State’s terrorist attack. 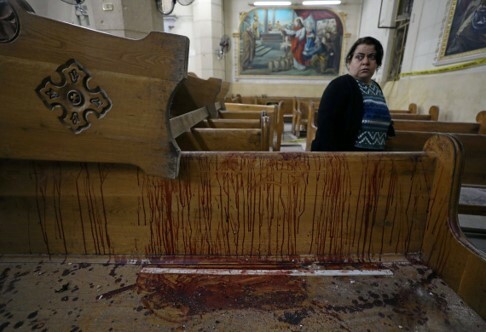 With 47 dead and two separate churches attacked, they have continued to target Egypt’s Christian population. 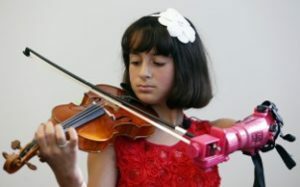 Specially made for her by George Mason engineering students, 10-year-old Isabella Nicola Cabrera plays the violin with her new 3D-printed prosthetic arm. Outside of Fox News‘s building, protesters take a stand against Bill O’Reilly. 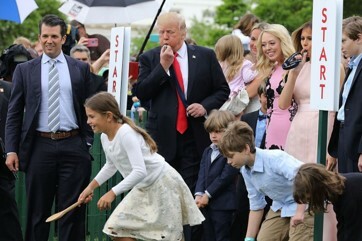 During the annual White House Easter Egg Roll, the President and First Lady, alongside the first family, blow the whistle to begin the race. 8-year-old Saffie Rose Roussos on the front page two days after the Manchester Arena Bombing. 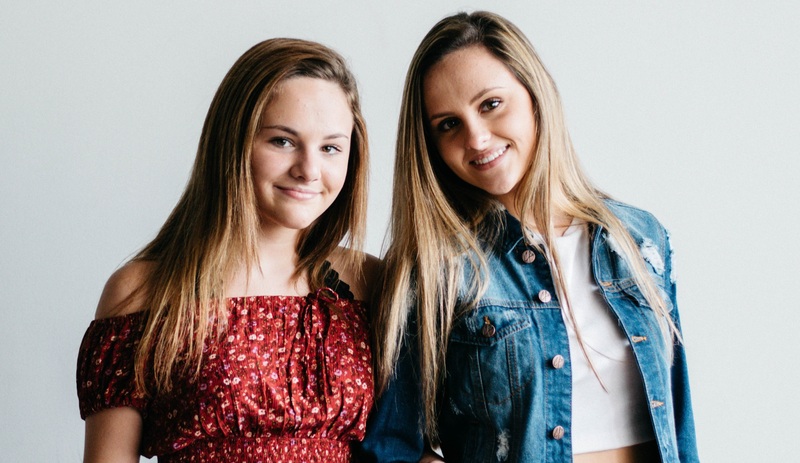 She was one the 22 victims killed during the Ariana Grande concert. 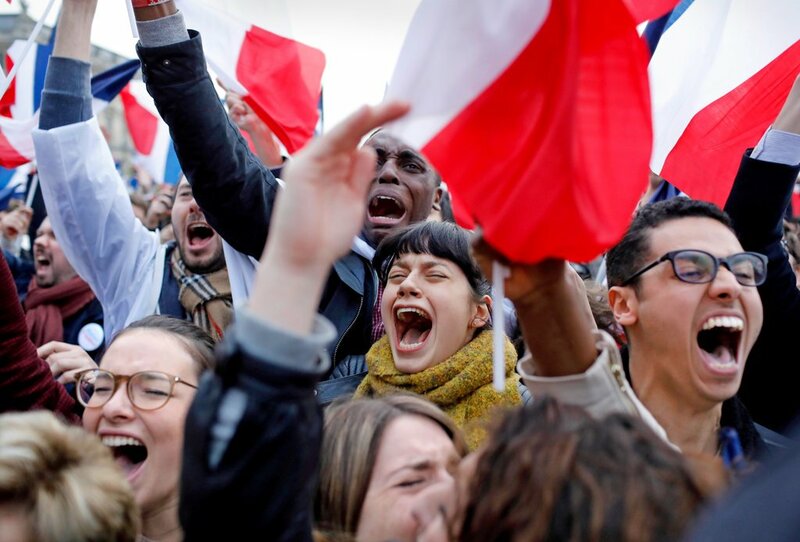 Supporters celebrate after presidential candidate Emmanuel Macron defeats Marine Le Pen, his far-right opponent. 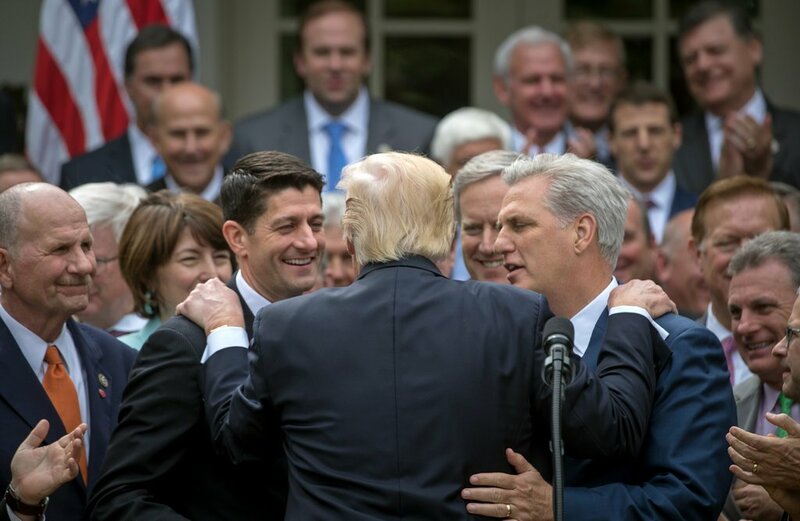 Having passed a measure to repeal and replace Obamacare in the House of Representatives, the President embraces the House Speaker(left) and majority leader(right). 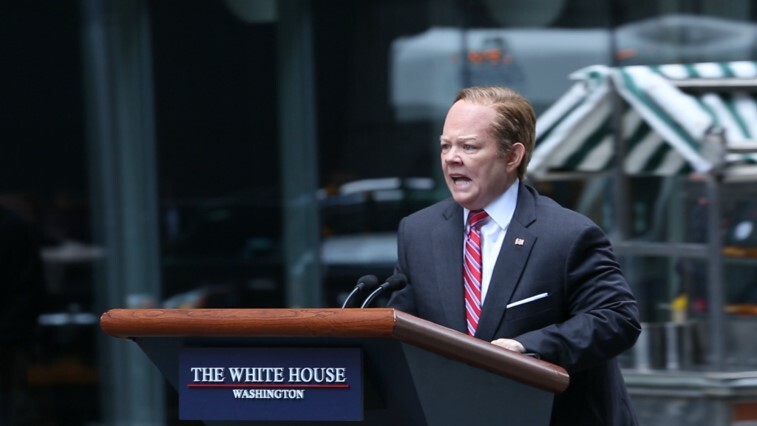 Melissa McCarthy’s Sean Spicer rolls through the streets of NY on a podium for the filming of an SNL skit. 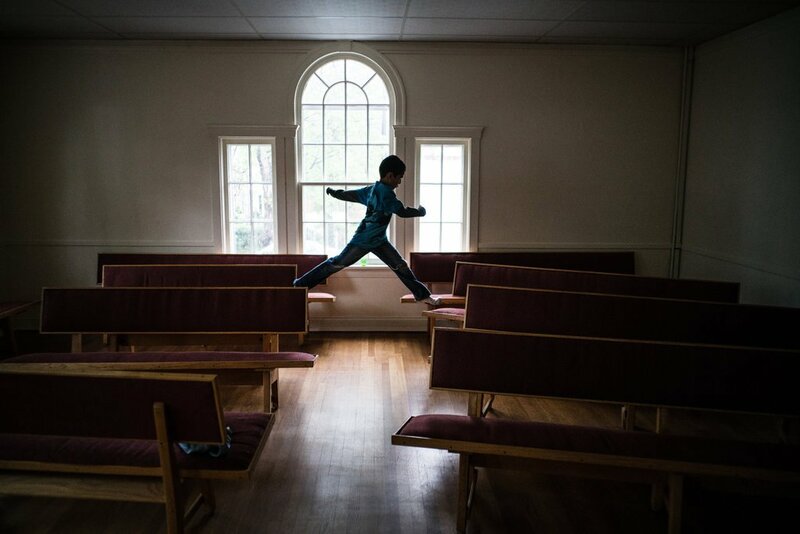 8-year-old Bryant Latorre, whose immigrant mother is facing deportation, plays in the Quaker church where they sought refuge for six months. 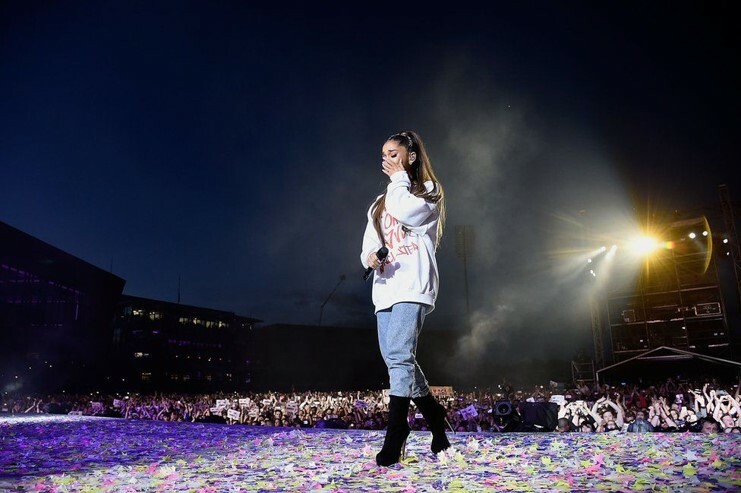 Ariana Grande onstage at the One Love Manchester concert. 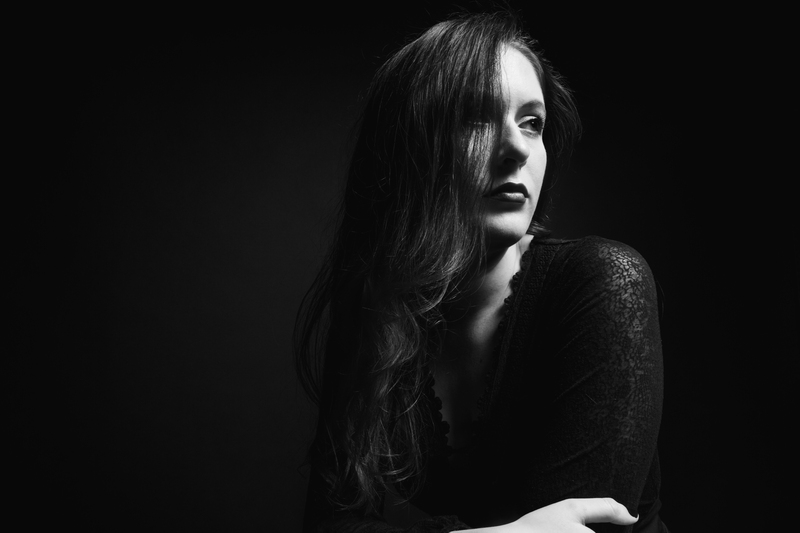 She organized the benefit concert in response to the Manchester Arena bombing that had taken place at her concert two weeks earlier. 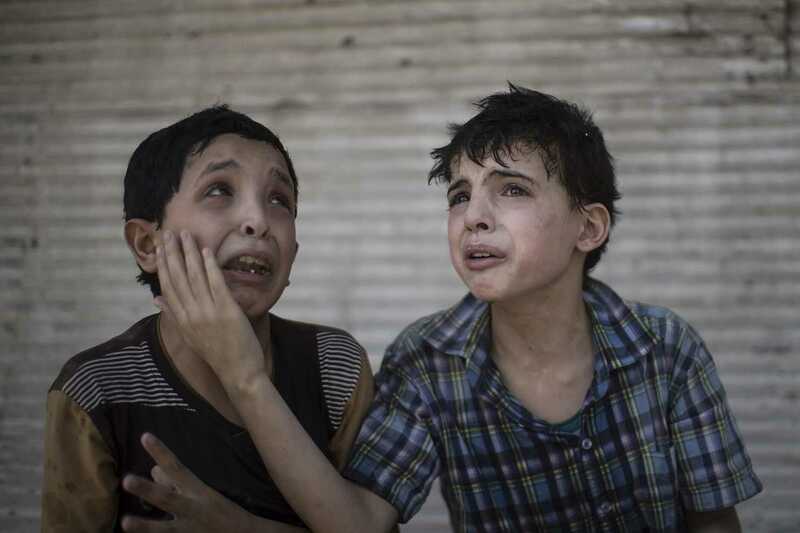 After a fight between Iraqi forces and the Islamic State militants destroyed their home and trapped family members in the rubble, cousins 12-year-old Zeid Ali (left) and 11-year-old Hodayfa Ali (right) comfort each other. 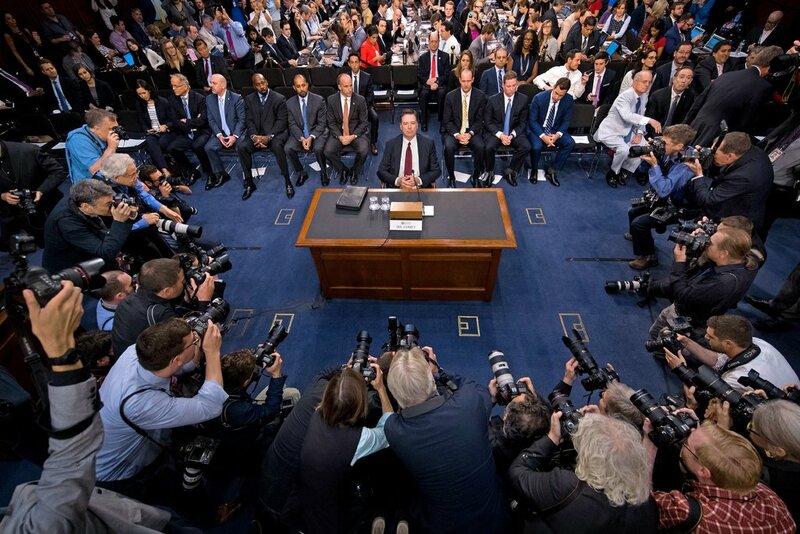 Former FBI Director James Comey sat before the Senate Intelligence Committee on Capitol Hill to give his testimony about his interactions with the President. Women protest against the Republican Senate healthcare bill’s cut for Planned Parenthood. 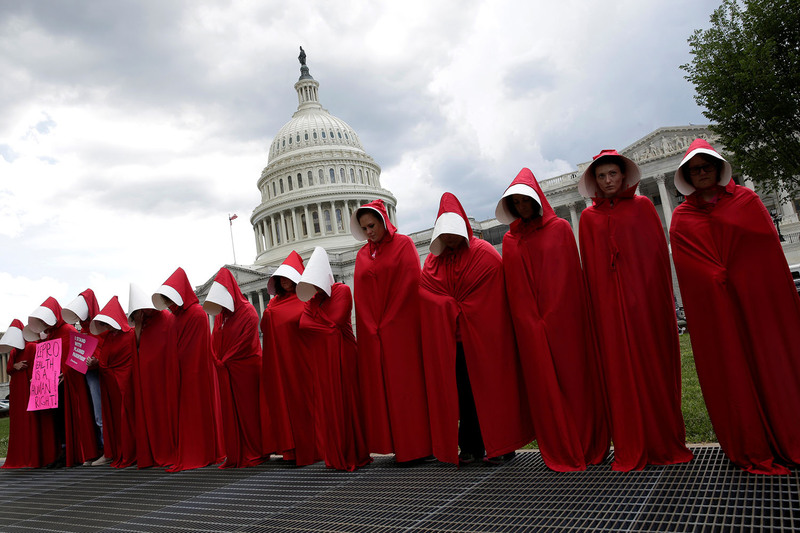 They are dressed as the handmaids from The Handmaid’s Tale. 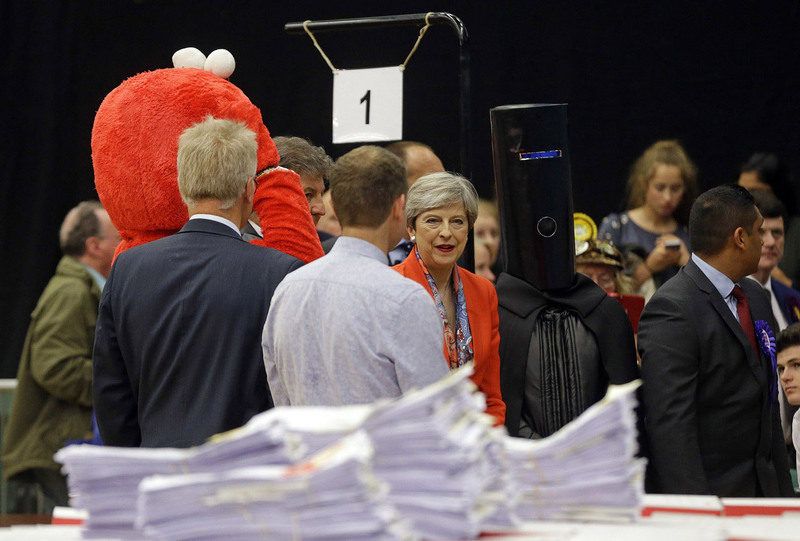 British Prime Minister Theresa May(center) and two other candidates, Lord Buckethead(right) and Give Me Back Elmo Party(left), await the general election results. Lord Buckethead received 249 votes. 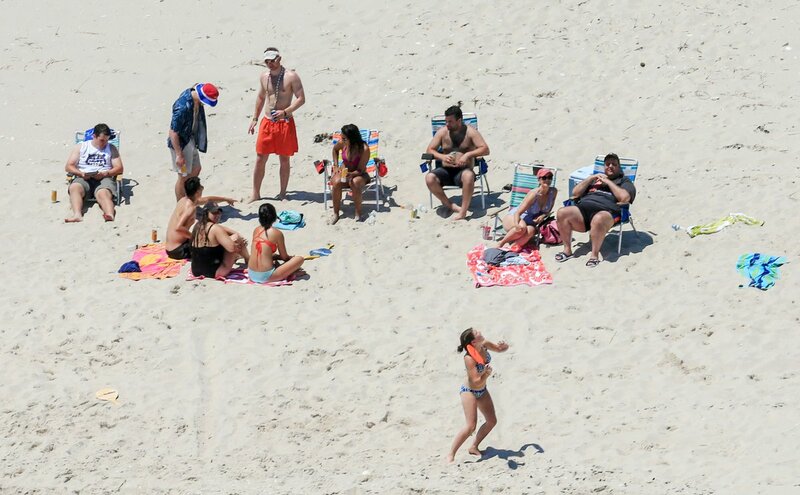 NJ’s Governor Chris Christie going to the beach with his family and friends after state-run beaches and parks were shut down, due to a budget fight, led to a controversy. Civilians walk and carry children past where once the Great Mosque of al-Nuir stood; the mosque’s original structure was believed to be completed in 1172 AD. As they flee, Iraqi forces are working on their advances against the Islamic State. 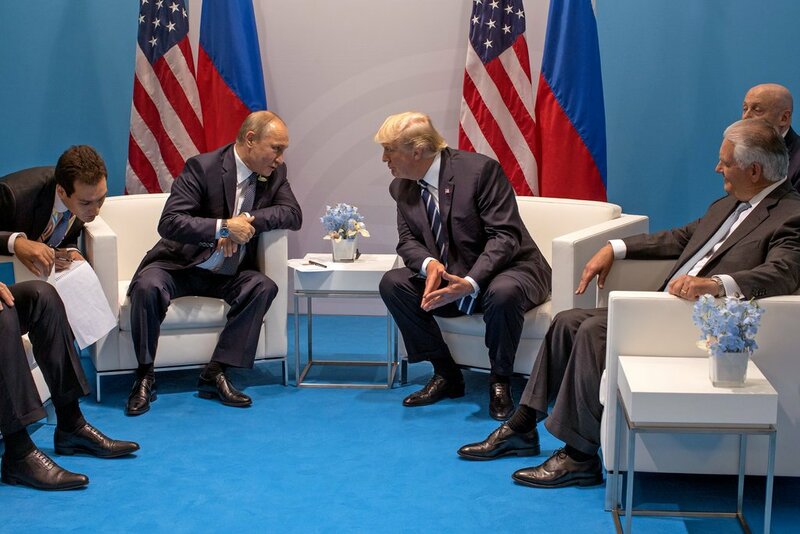 Presidents Trump and Putin meet at a G20 summit meeting. 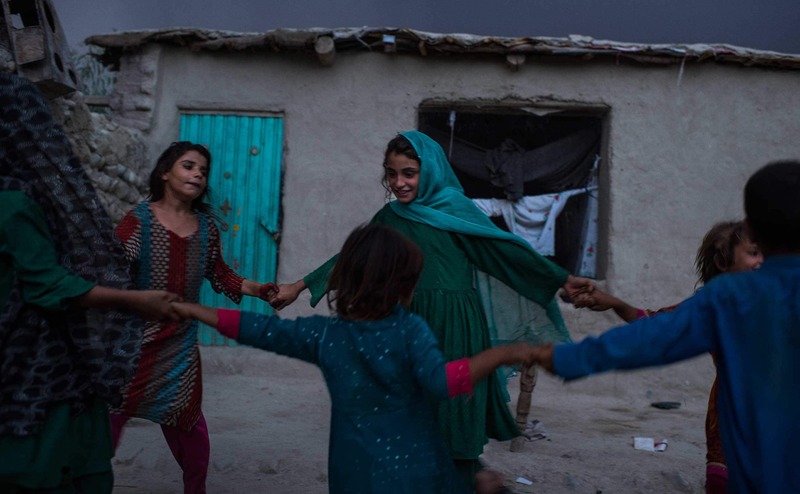 In the Surkh Rod district of Nangarhar province, children of a woman named Shaguftar, play in the yard of their home with other displaced neighbors. Her family fled to the district after her husband, a government employee, was killed by the Islamic State. After being kidnapped and raped by the Islamic State militant, this teen fled after an airstrike on Mosul killed her captor. 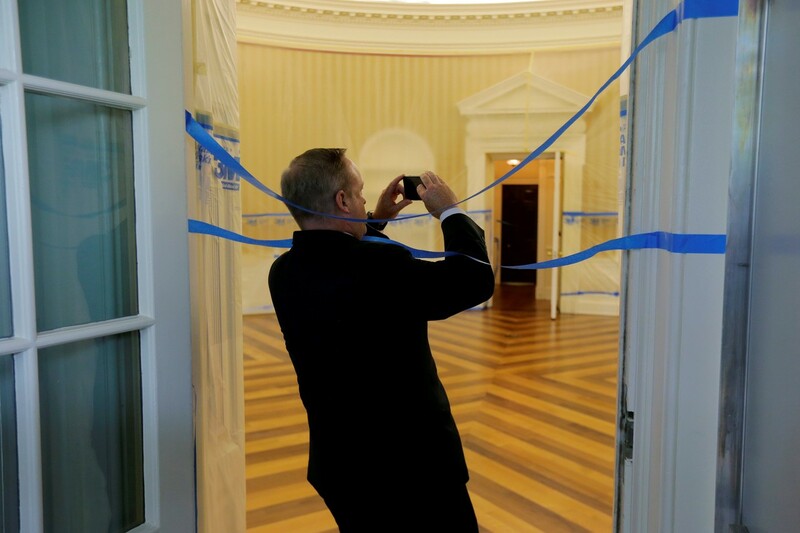 Former White House press secretary takes pictures of the Oval. After his resignation, Sean Spicer returned to the Oval only to find it vacant due to renovations. Law enforcement officials and the injured after a van ran over civilians on a busy street. 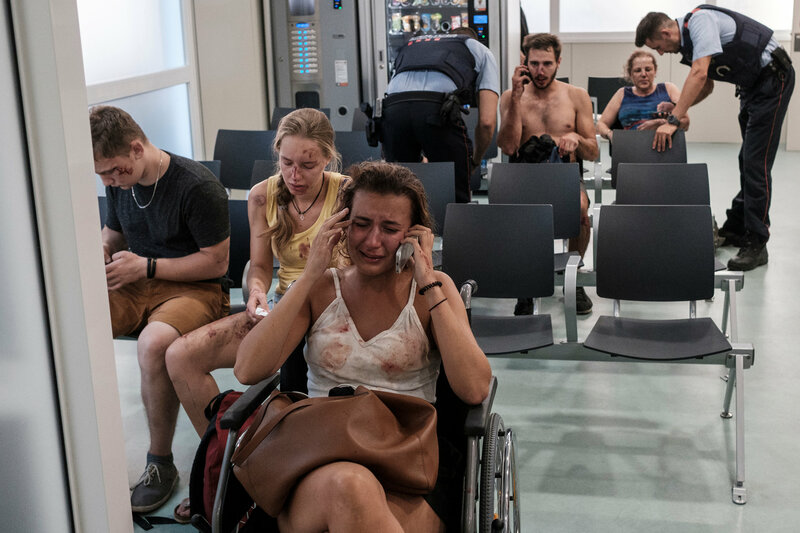 Twin terrorists attacks in the city and a resort left 14 dead. 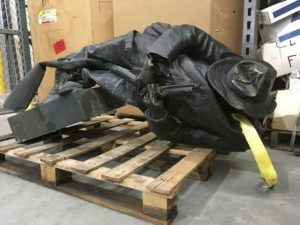 Confederate statue damaged by protesters lays in a warehouse. The 1924 statue was standing in front of local government offices that were previously a courthouse building. 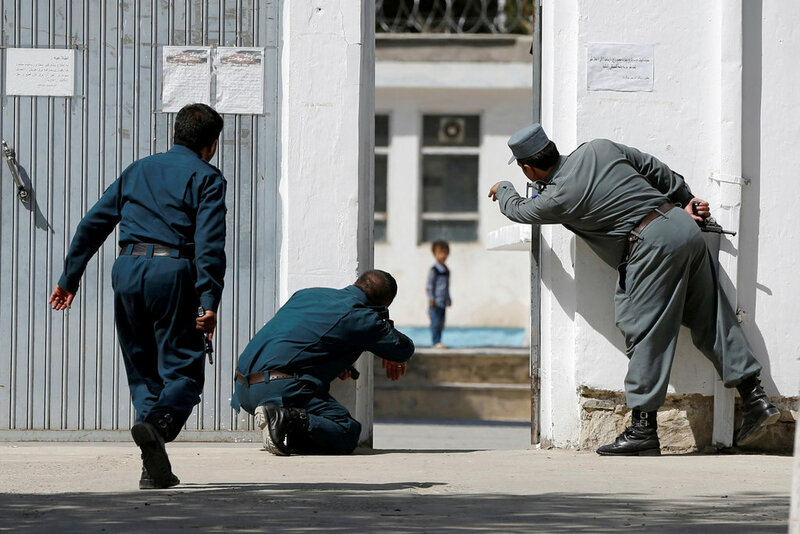 Policemen work to bring a child to safety after the mosque was bombed. 40 people were killed. 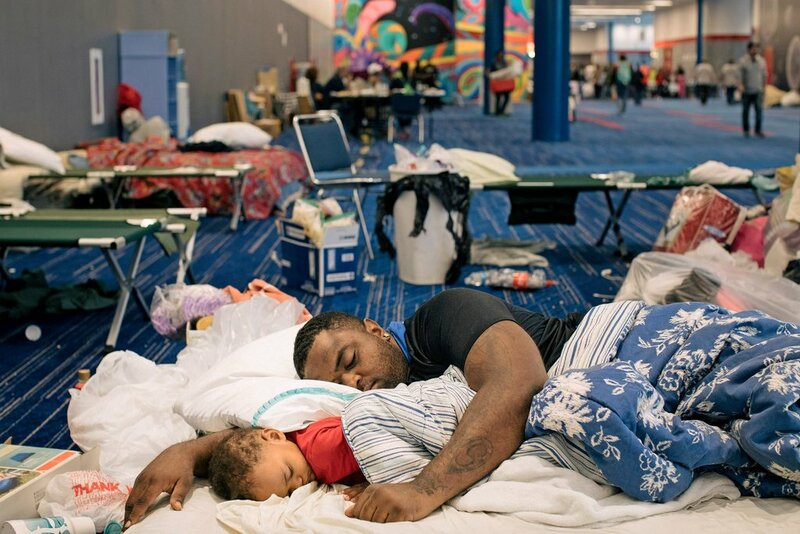 Father and son, Gerald and Gavir Sam, take shelter at a convention center after Hurricane Harvey. Texas residents lost over 170,000 homes. 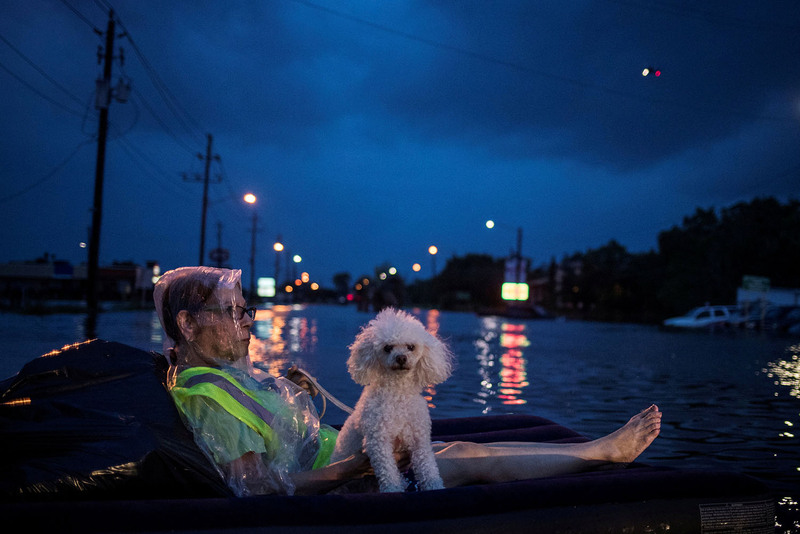 Floating on an air mattress with her poodle, an elderly woman waits to be rescued as a helicopter flies above her. Hurricane Harvey had flooded Scarsdale Boulevard. 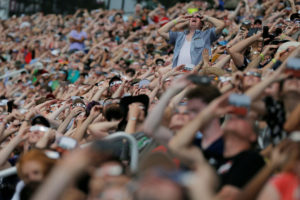 At Southern Illinois University’s football stadium, spectators watch moments before the total eclipse. 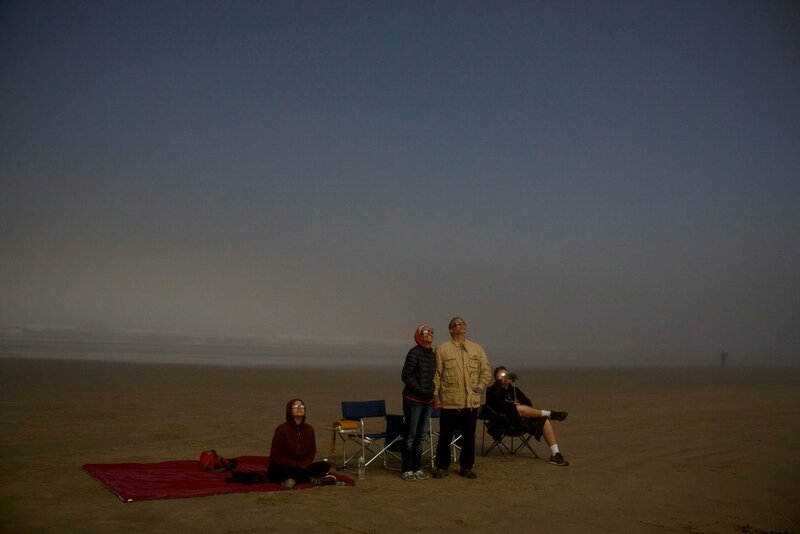 Spectators turn to the sky to watch the total solar eclipse. Seen from outer space, the moon’s shadow over the United States during the total solar eclipse. 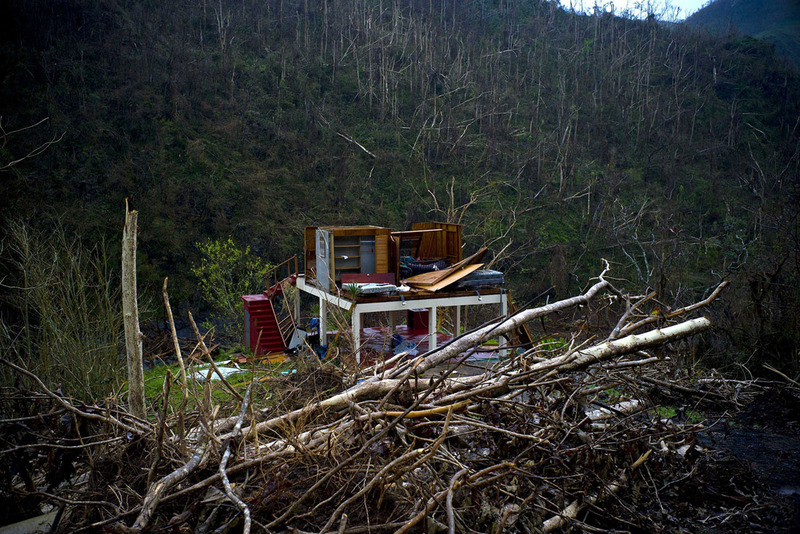 A destroyed house stands among the mountains after Hurricane Maria went through the neighborhood of San Lorenzo. 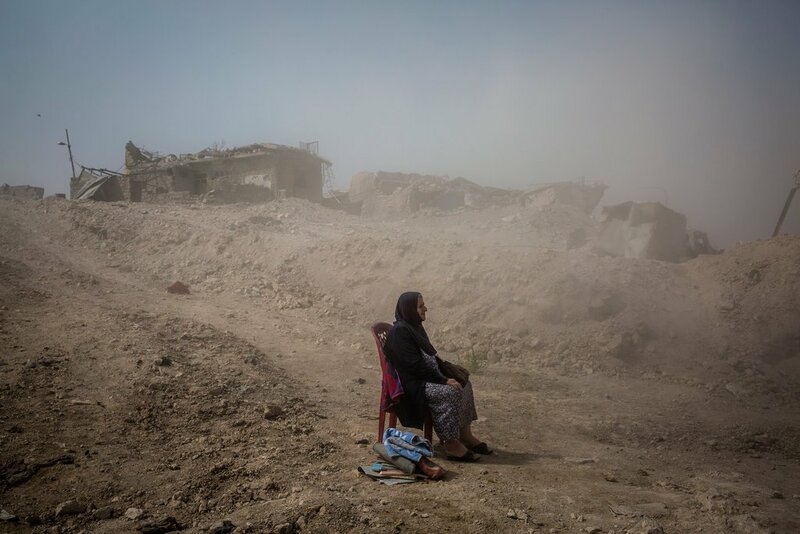 After an airstrike hit near her home, Nadhira Aziz awaits in the dust as workers dig for her relatives’ bodies. 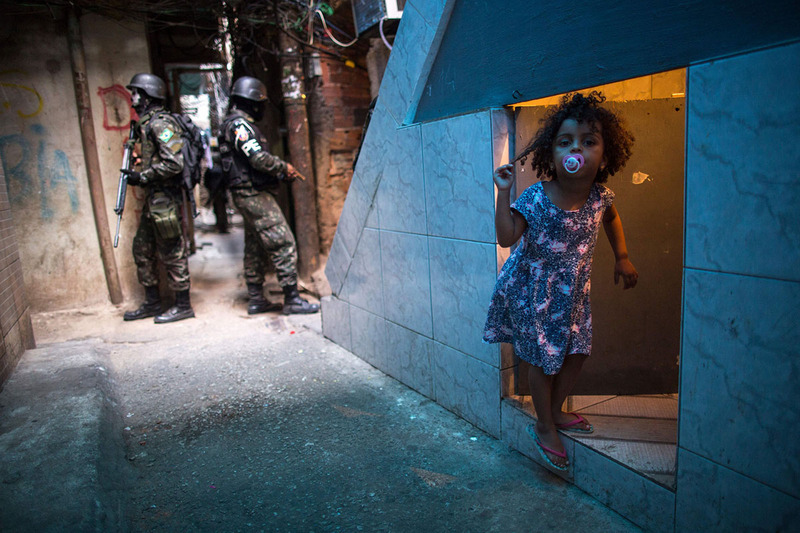 In Brazil’s Rocinha favela, Brazilian military police patrol an alley after shootings in various areas of Rio lead to the shut down of roads and schools. 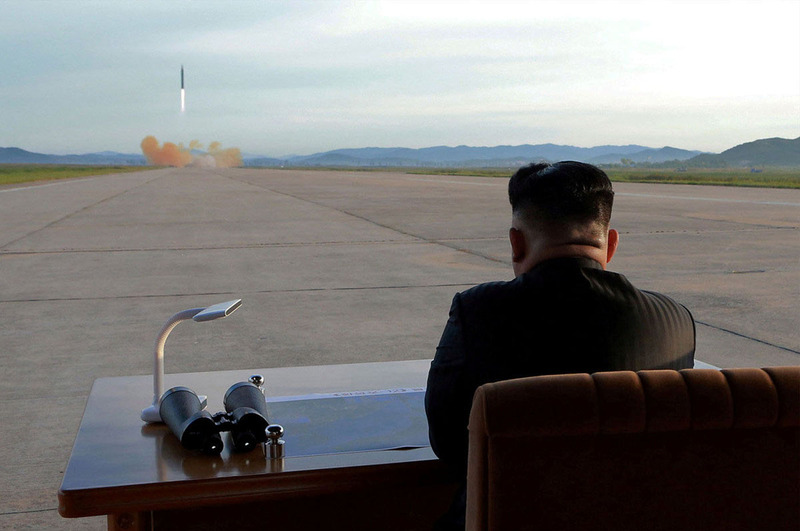 Released by North Korea’s official news agency, the undated photo shows Kim Jong-Un watching the launch drill of a ballistic rocket. 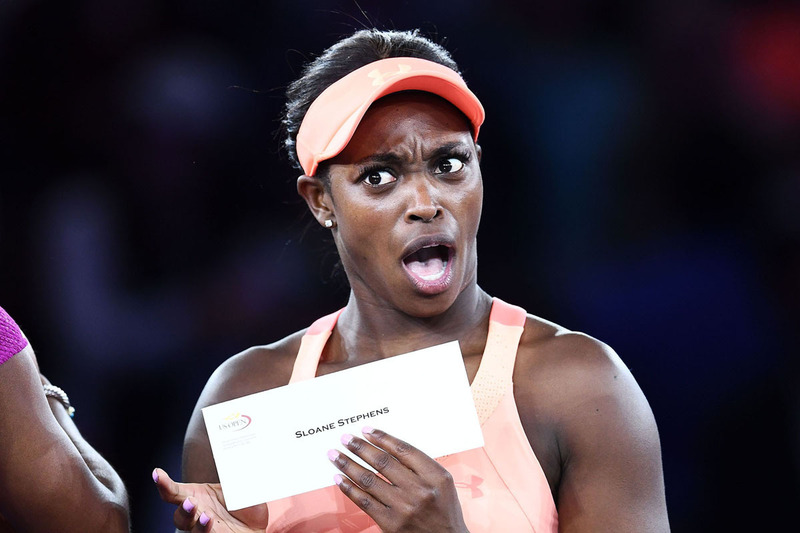 Sloane Stephens receives her winning check after winning the 2017 U.S. Open Women’s Singles final match. She won her first Grand Slam title after defeating Madison Keys at the USTA Billie Jean King National Tennis Center. 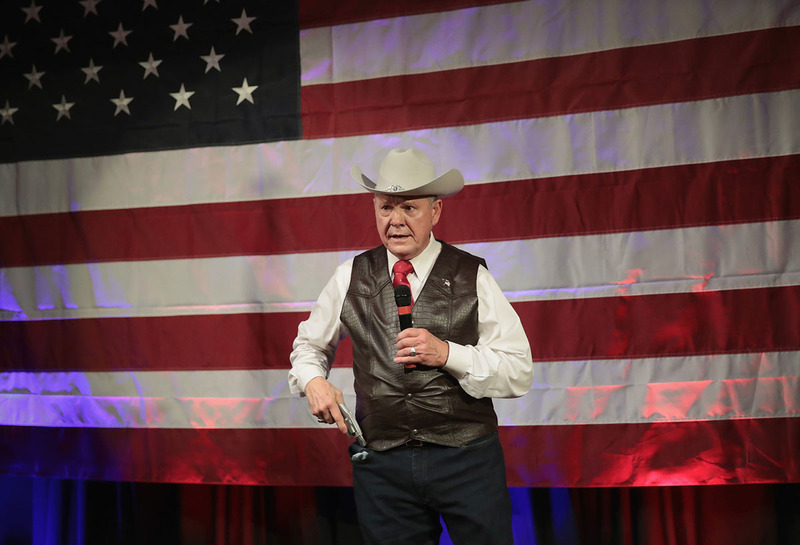 Running for Alabama’s U.S. Senate seat, Republican candidate Roy Moore takes out a pistol at a campaign rally for the purpose of showing his support for the second amendment. He lost the election in December. 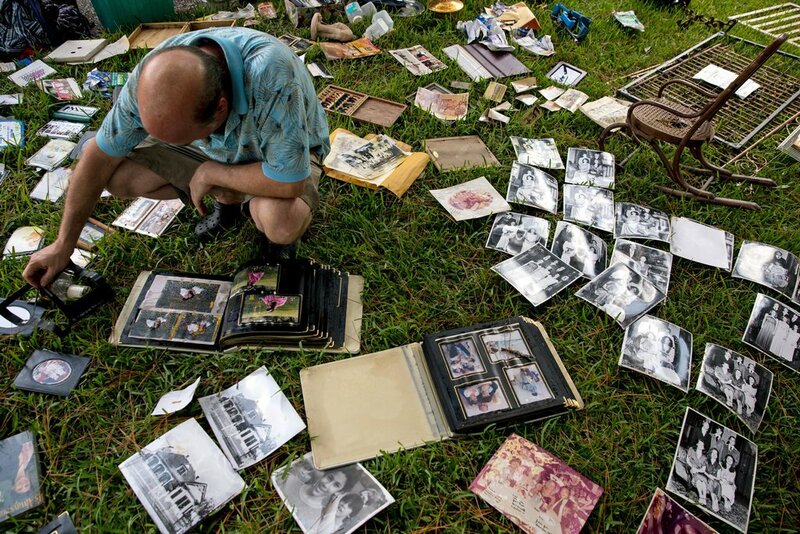 Man looks through photos displaced after Hurricane Harvey. 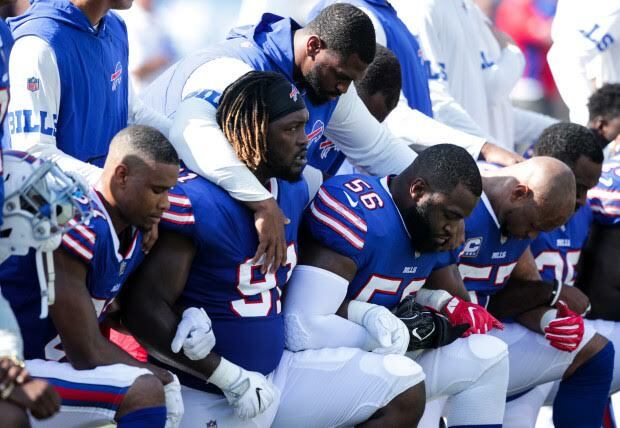 Before an NFL game against the Denver Broncos, Buffalo Bills players kneel during the National anthem. After Kaepernick’s protest began last year, several followed suit to protect police brutality against black people and bring attention to the black lives matter movement. 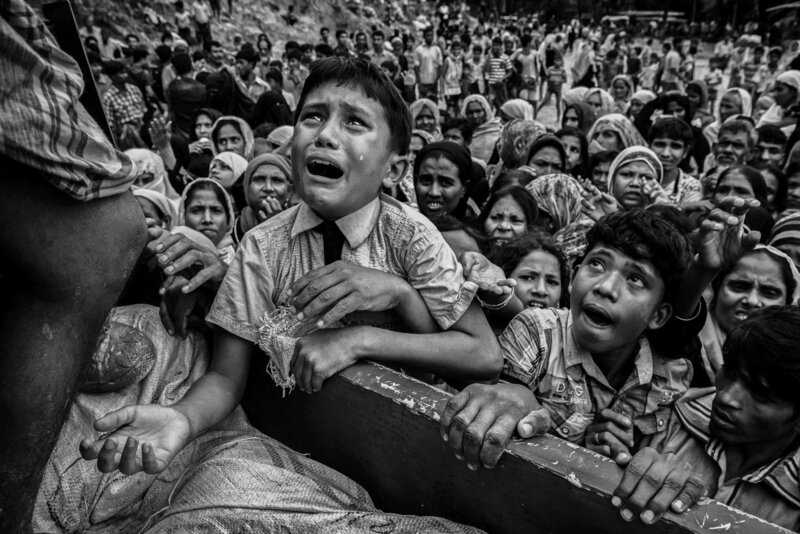 In a crowd desperate for aid near the Balukhali refugee camp, a Rohingya refugee cries as he climbs onto a truck. 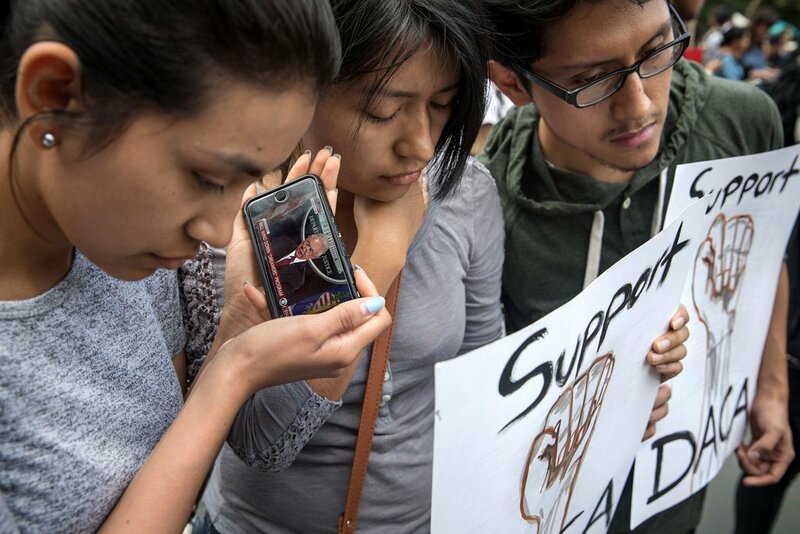 People closely listening to Attorney General Jeff Session announce that the Deferred Action for Childhood Arrivals program would end and therefore leaving 800,000 young people brought to the U.S. as children without protection from the government and prone to deportation. 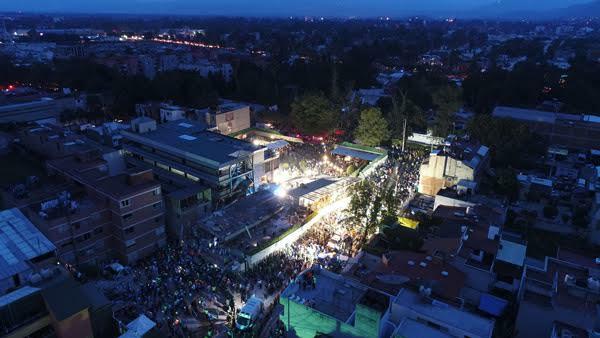 Several people: firefighter, policemen, soldiers and volunteers, continue to clear debris from a building flattened after a 7.1 magnitude earthquake. 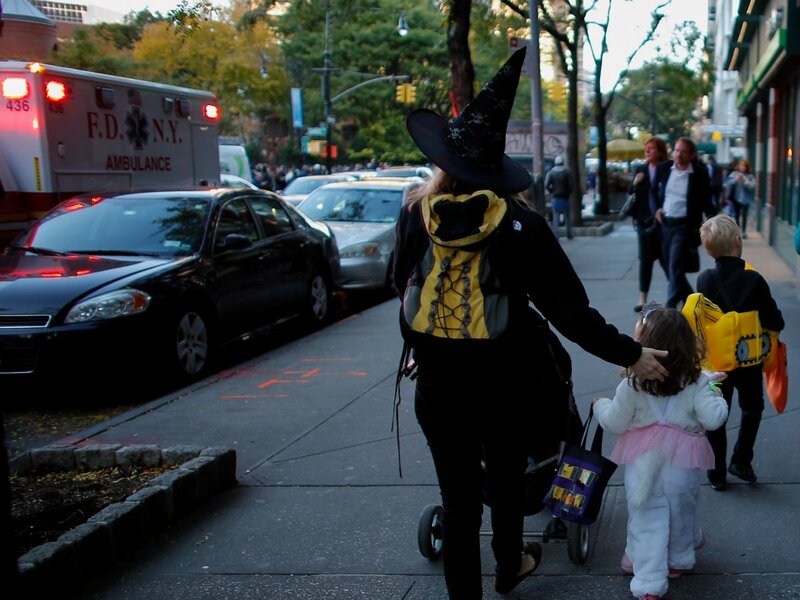 People on the streets of NYC after a terrorist drove a rental Home Depot truck onto a bike lane on Halloween, killing 8 people. Former Equifax CEO (center) before testifying in front of the U.S. Senate Banking Committee about how hackers stole the personal information of 145 million Americans. 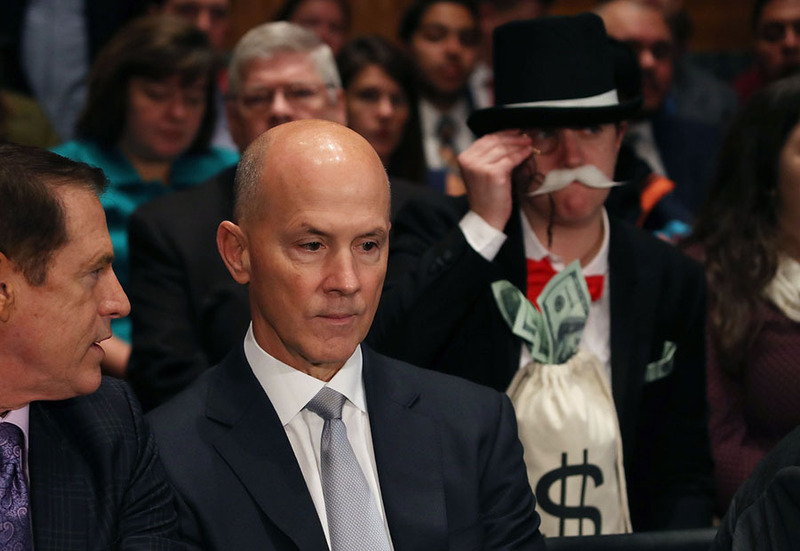 Behind Richard Smith(center) stands a protester dressed as Monopoly Man. 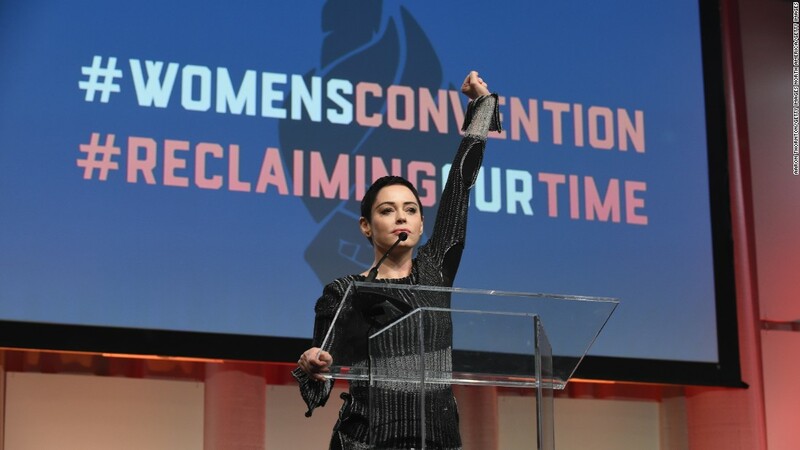 Hollywood actress Rose McGowan raises her fist at the Women’s Convention in Detroit where she spoke about the #MeToo movement and toxic culture in Hollywood. Several sexual harassment and abuse allegations against Harvey Weinstein have surfaced after actresses, such as Rose McGowan, models, ex-employees and several other women came out. 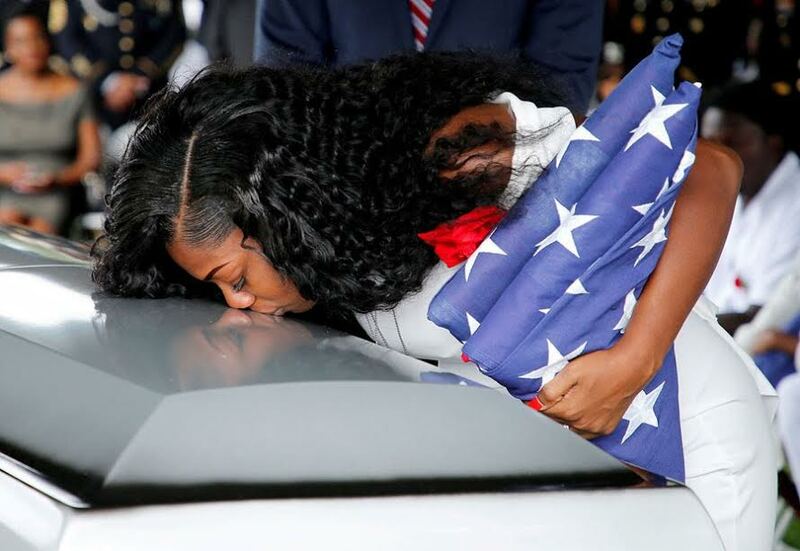 Myeshia Johnson, widow of U.S. Army Sergeant La David Johnson, kisses her husband’s coffin. He was one of the four special forces soldiers killed in Niger. 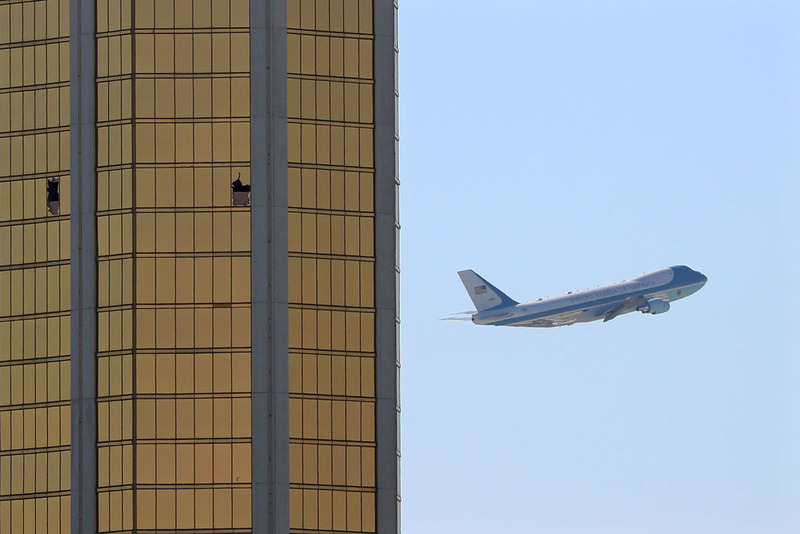 Air Force One takes off three days after Stephen Paddock conducted the deadliest mass shooting in modern American history. 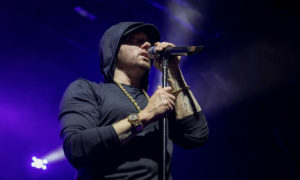 In the background is the Mandalay Bay Hotel, where he acted from. 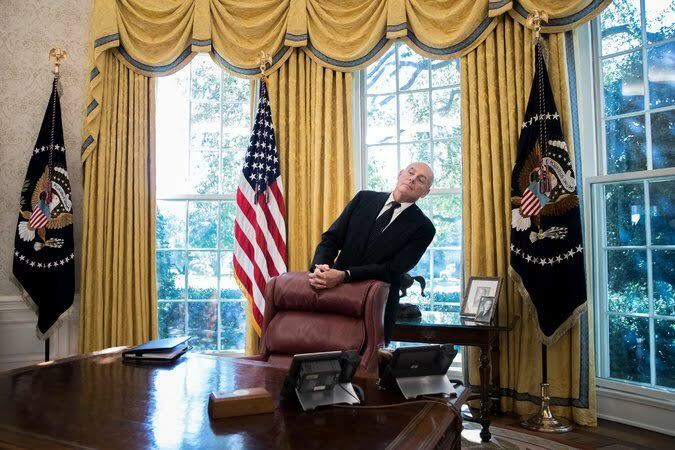 White House chief of staff John Kelly keeping an eye on the President. 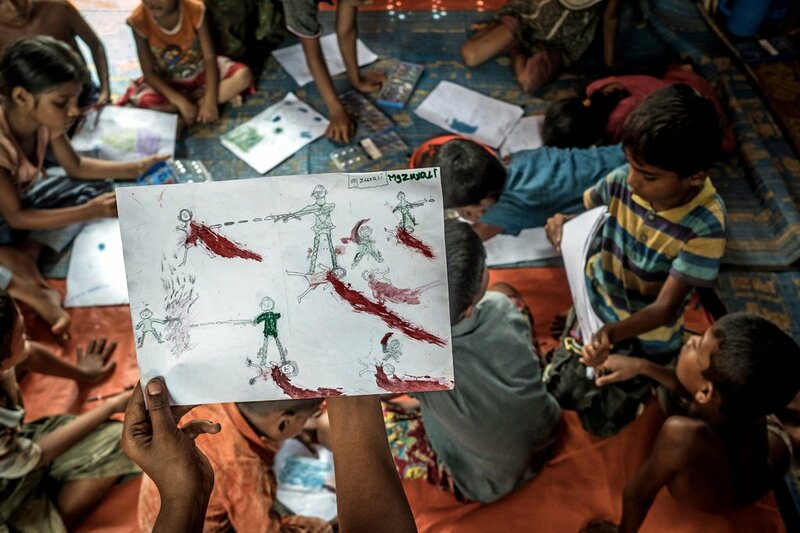 Having fled Myanmar’s ethnic cleansing, a Rohingya boy in a refugee camp shows his drawing. 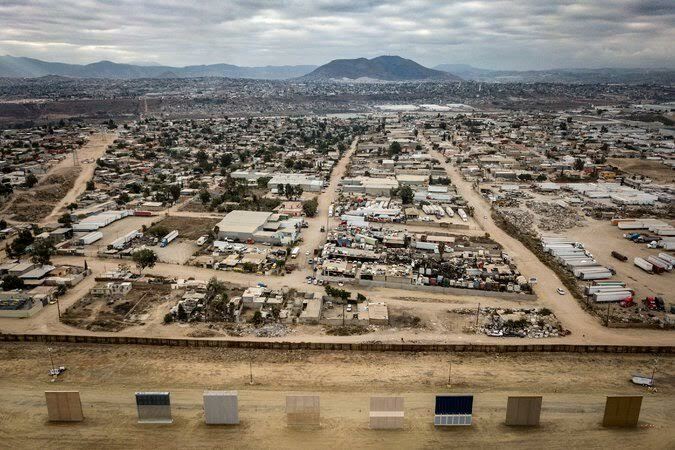 Beyond the samples of the walls being looked at for the border, lies the city of Tijuana. Family and friends mourn at a man’s grave. He was killed during a battle to push the Islamic State out of Raqqa, Syria. 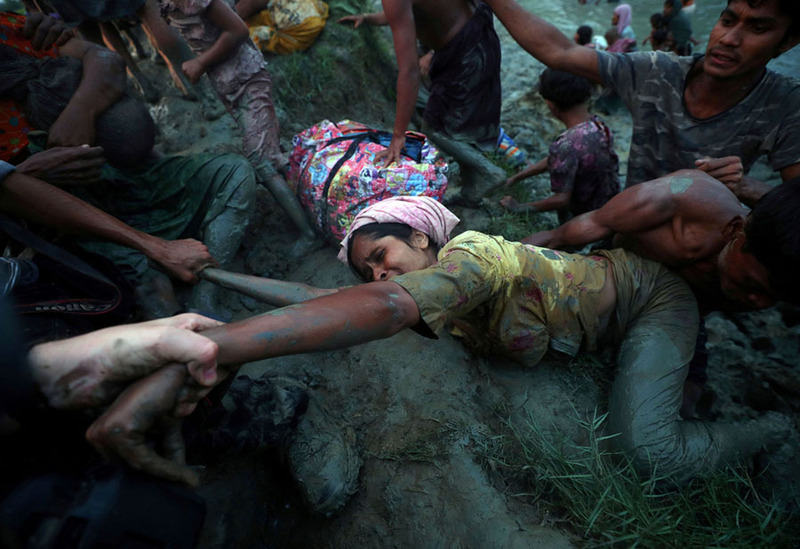 On the Burma-Bangladesh border, photographers help a refugee out of a river as hundreds of other refugees follow behind her. 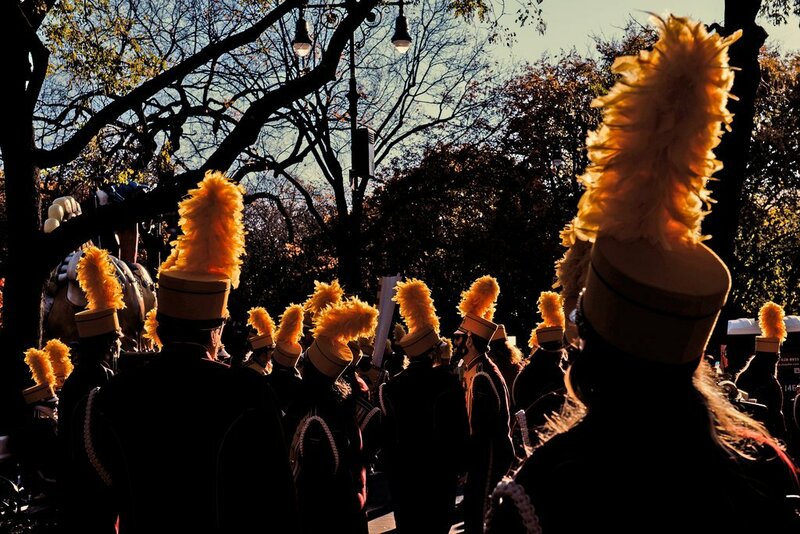 During the 91st Macy’s Thanksgiving Day Parade, marching band members await their turn. In the First Baptist Church of Sutherland Springs people pray. A week earlier shooter David Patrick Kelley had killed 26 people during a Sunday service. 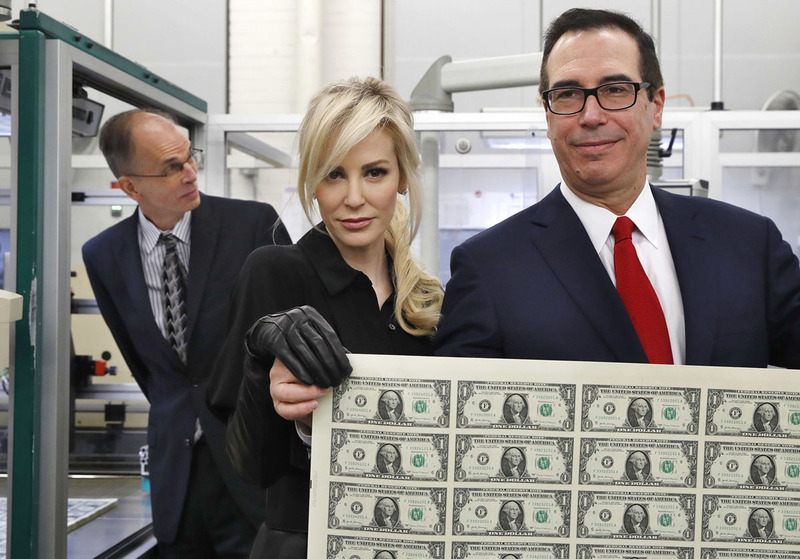 Alongside his wife, Louise Linton, U.S. Treasury Secretary Steven Mnuchin holds the first one dollar bills bearing his signature. Texas Democrat Sheila Jackson Lee holds up a photo of a woman who accused Alabama Senate candidate Roy Moore of sexual assault when she was 14 years old. 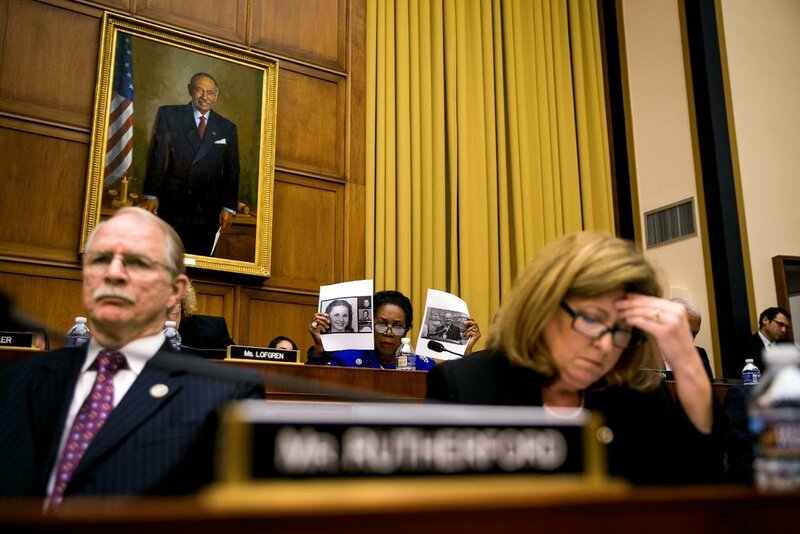 Hanging behind her during the House Judiciary committee hearing is the portrait of Representative John Conyers Jr. 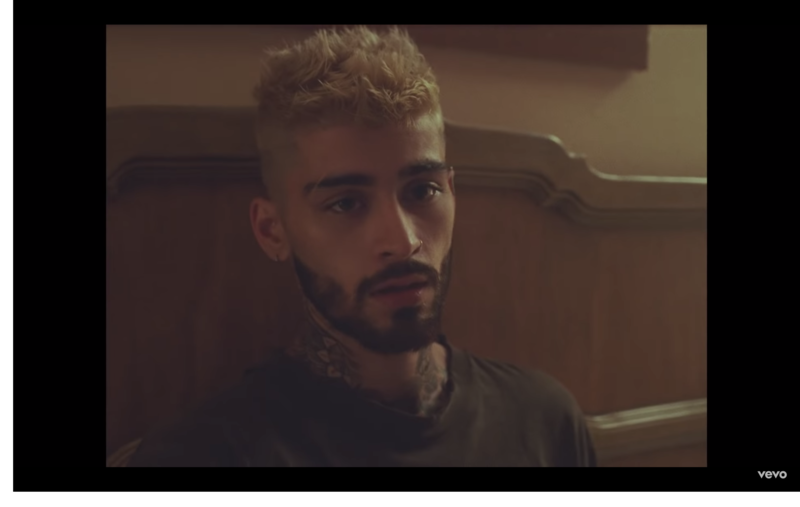 He signed his resignation in December after accusations of sexual harassment surfaced. 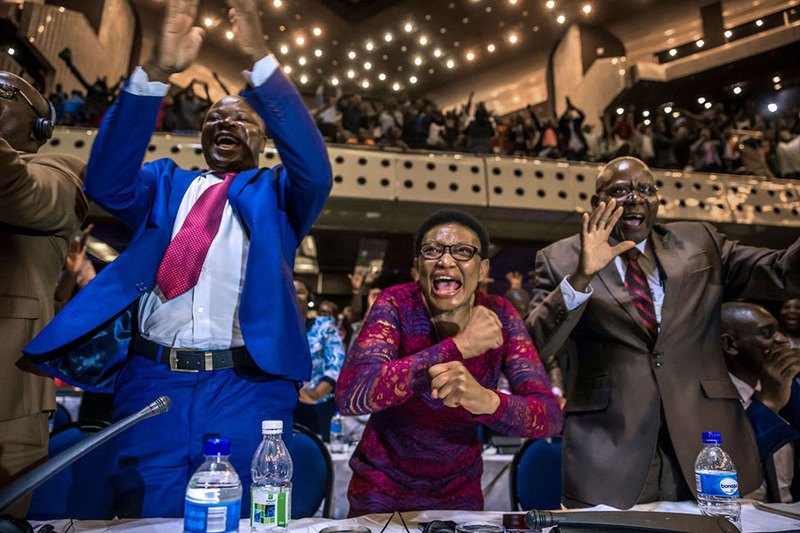 As the resignation of Zimbabwe President Robert Mugabe is announced, members of parliament celebrate. Mugabe had held office for three decades. 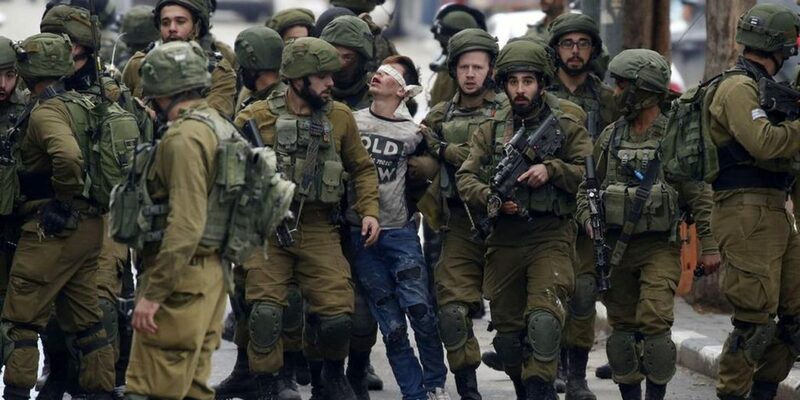 16-year-old Palestinian Fawzi al-Junaidi is taken away by Israeli soldiers. 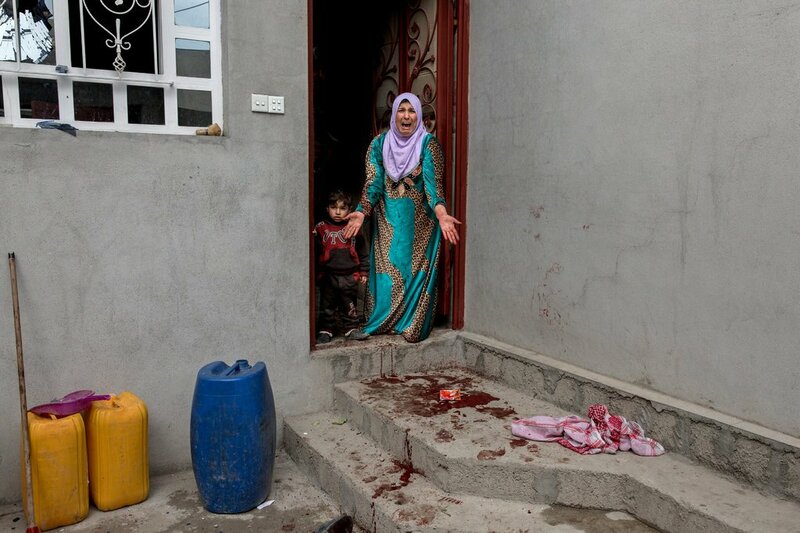 Accused of throwing stones at Israeli soldiers, his charges were to be overseen in an Israeli military court. 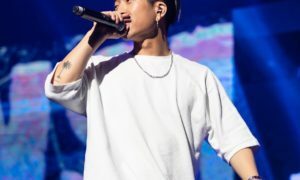 He was one of the protesters in the West Bank, East Jerusalem, and the Gaza Strip after the U.S. announced that Jerusalem would be recognized as Israel’s capital. 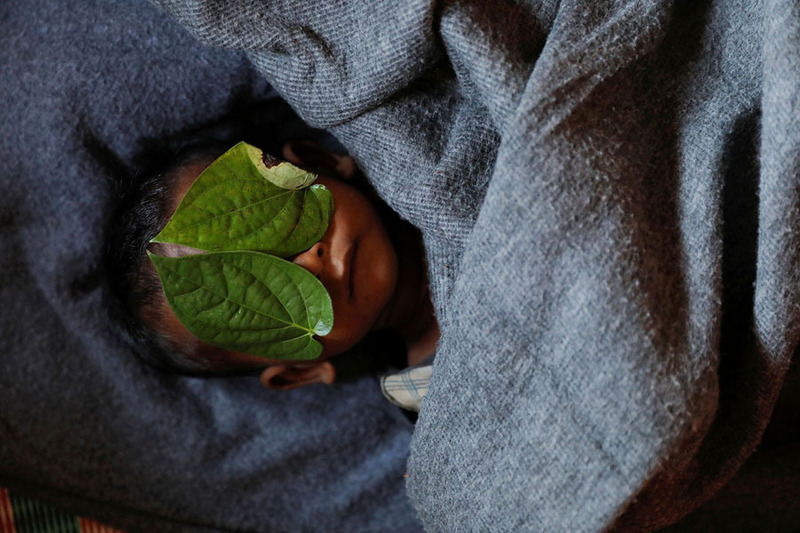 Leaves lay on the face of 11 month-old Abdul Aziz, a Rohingya refugee at the Balukhali refugee camp. 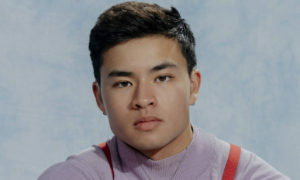 He died at a local clinic after a ten day long severe cough and high fever. 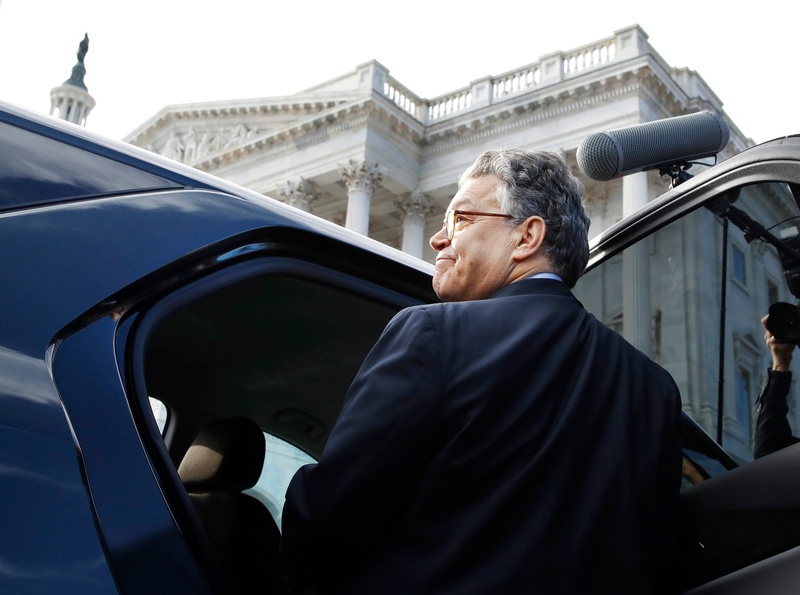 Senator Al Franken leaving the Capitol. After several allegations of sexual misconduct, including a picture of him groping a sleeping woman on a military plane, surfaced, Franken announced he would be stepping down. 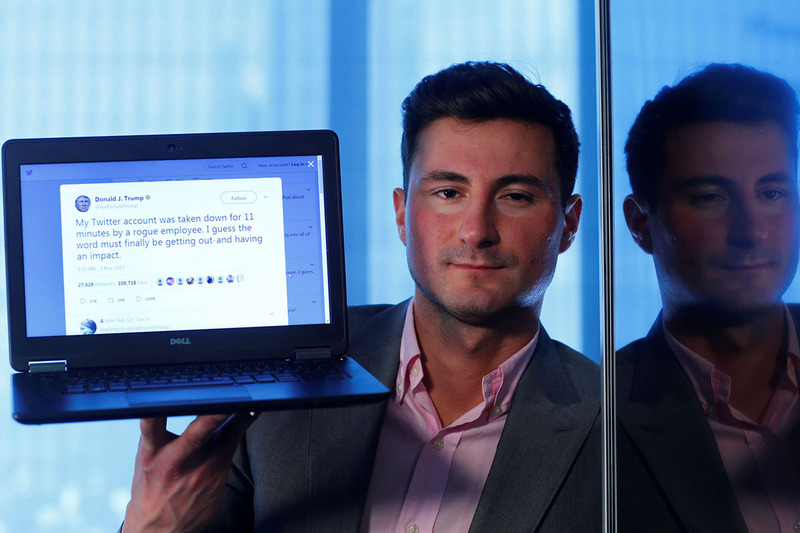 Former and temporary Twitter employee Bahtiyar Duysak gives an interview about how he deactivated President Trump’s twitter account for 11 min. 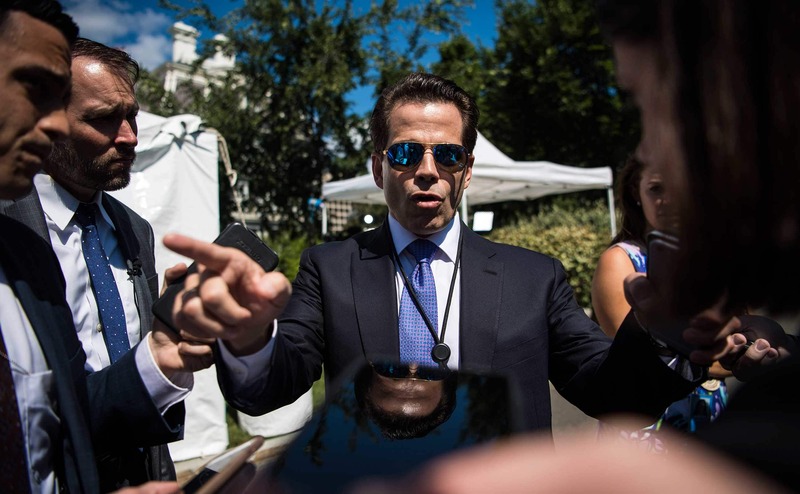 On his last day on the job, he noticed someone reported the President’s account and decided to start the deactivation process before walking out the door. Hundreds of fearful Southern California residents called law enforcement after seeing the light of a rocket launching satellites into space from Vandenburg Air Force Base. With people saying it was a UFO or alien invasion, Elon Musk created buzz by tweeting “Nuclear alien UFO from North Korea”.